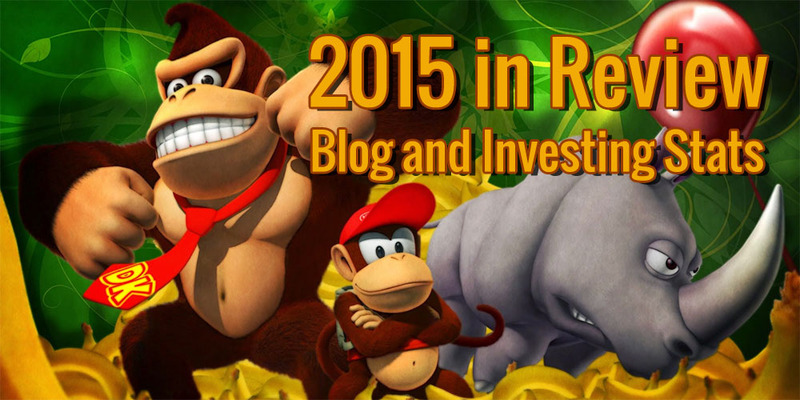 What’s more appropriate than a badass Donkey Kong, his buddy Diddy Kong, and trusty Rambi the Rhinoceros to depict the year 2015? Nothing in my humble opinion. DK’s smile, Diddy’s smug look, and Rambi’s forward-dashing stance clearly show how happy and satisfied I am with the progress I made this year and how dedicated I am to continue the same way in 2016. Also, it’s infographic time! Well yes, dear visitor. Since I like infographics so much I thought I’d give them a spin and create one myself for my 2015 review. And I must say I’m rather pleased with the result. It consists of four main parts: the activity on this blog, visitor characteristics, my net worth growth, and a review of my goals. While infographics convey a lot of information in a fast and neat manner, they fall short in clarifying subtleties – statistics remain statistics after all. So if you feel like the infographic to the right doesn’t cover my 2015 in enough detail, simply continue reading. Oh, and for reference sake, be sure to check out my 2015 goals if you haven’t read that article before. 2015 was a stellar year on the blogging front. It marked the first anniversary of my blog and already you guys have surpassed my wildest expectations. 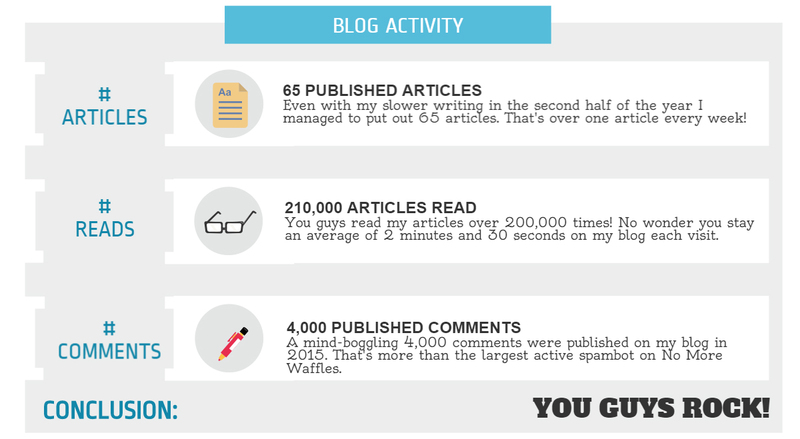 Over the entire year No More Waffles served up 65 brand-new articles, which together with the 2014 articles were read a total of 210,000 times. On top of that many of you also came out of the woodwork and contributed to the lively discussions in the comments section. At over 4,000 comments it’s fair to say that our community remains as tight-knit as I first experienced when starting out in July of 2014. Of course, these numbers have to come from somewhere – you, the readers. In 2015 you guys grew to a massive 42,378 in total! And I use the word “guys” quite literally here since 87% of this blog’s visitors are males. I guess the stereotype that men are generally more interested in finance holds some truth – where’s smoke there’s fire, after all. The United States of America confirms its title as the number one capitalist country in the world, delivering 19% of all readership. 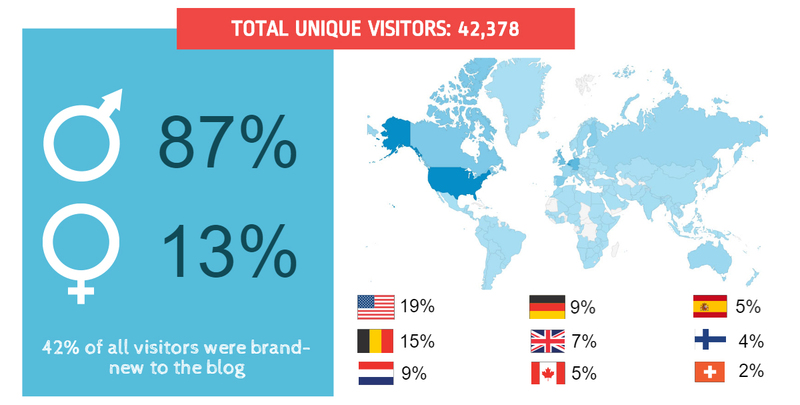 However, most visitors turn out to be from the other side of the Atlantic ocean with Belgium, Holland, Germany and the United Kingdom making up the bulk of European readers. At the end of 2014 I said “go big or go home” and that’s exactly what I did with my 2015 net worth goal. Guess what? I made it big! 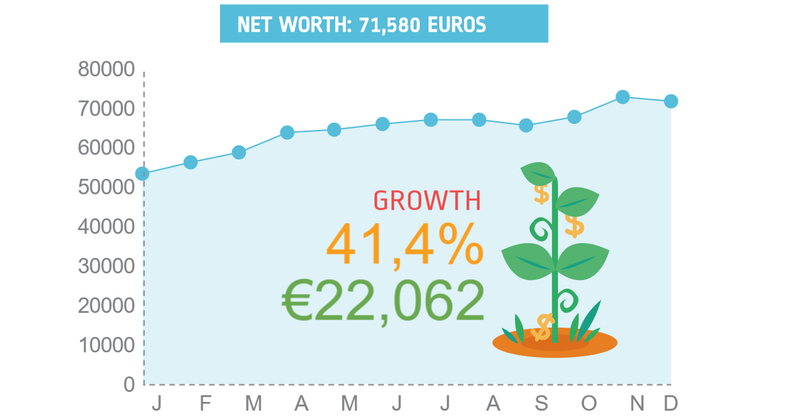 With a net worth increase of 41% I finish the year with €71,580 in assets, most of which generate a solid stream of passive income. Interestingly, this number turns out to be a bit higher than first reported, mainly because my December savings rate remains unknown at the time of putting the infographic and this article together. That’s why you’ll see another big spike upwards in January’s update. Apart from achieving a personal net worth of 70,000 Euros I also set five other goals. First, I wanted to match 2014’s savings rate, as explained in last year’s review. My new road bike, which I also use to commute to work, spoiled that party though. I finished just shy of my goal at 67% of my total annual income. Still, I couldn’t be happier about that number. Speaking of commuting to work by bike, I did manage to do so over 50 times the past months. That’s another goal out of the way! Now that I’ve got the hang of riding my bike to work – yes, it requires a bit more planning ahead than just getting on the train each morning – I even think of cycling to work every single day of the week. Third, I hoped to follow three work-related trainings and one hobby-related one. It was a close call, but I can also tick this box! At the beginning of the year a bunch of friends dragged me into dancing classes, something I really wasn’t prepared for at the time. Expanding my comfort zone keeps me fresh and young though, so I hesitantly said yes. 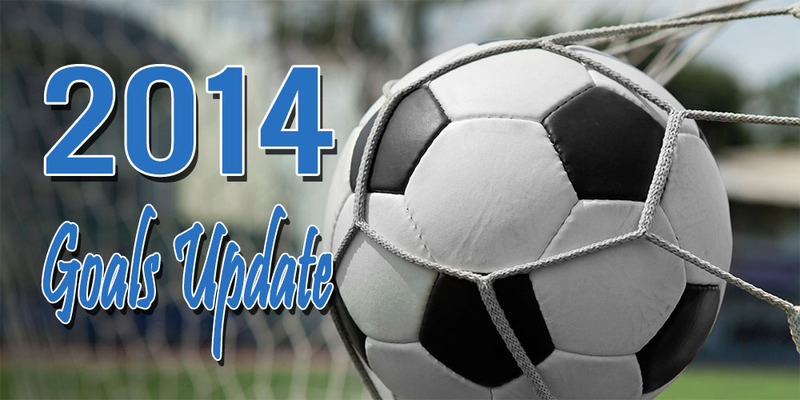 Fourth, the main goal for this blog was to serve up to 100,000 page views by the end of the year. In june I had already reached that number, and as mentioned above it didn’t stop there with 210,000 articles read in total. 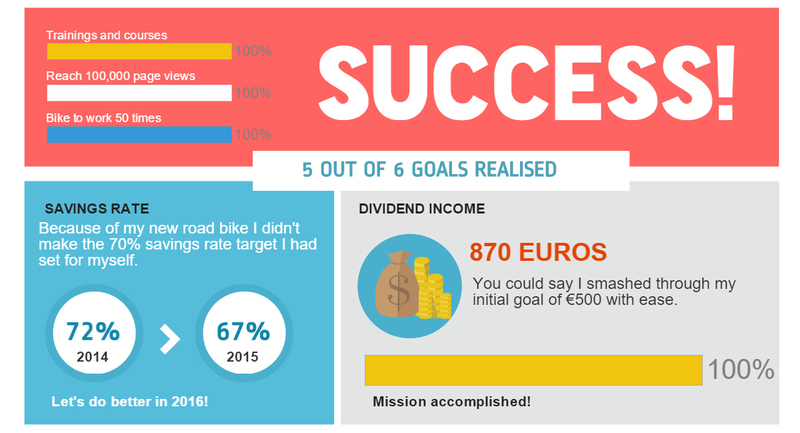 Lastly, and quite possibly the main goal of this blog, I set out to make €500 in dividend income. By mid-september the blue progress bar on my blog showed a bold 100% already, so it’s no surprise that passive income stands at 870 Euros in total for 2015. Boom! That’s a total of five out of six objectives realised. All of the above in the name of financial independence, whew. In my opinion it’s totally worth it. Financial independence is a process of self-improvement, a process in which you slowly build yourself to the point you’re less reliant on outside forces for both personal and financial security. And that’s what I feel I’ve achieved this year. Not only are all financial indicators pointing firmly upwards, my curious and always-eager-to-learn mind got its way too. On top of that, I’m feeling better than ever due to all the cycling. All in all, I’m a better version of myself. I’m NMW 2.0, if you’d like. Yes, there are some things that I’d like to see different next year, such as avoiding another Kinder Morgan debacle or actually achieving my savings goal, but I’m not here to play the Complain Game. 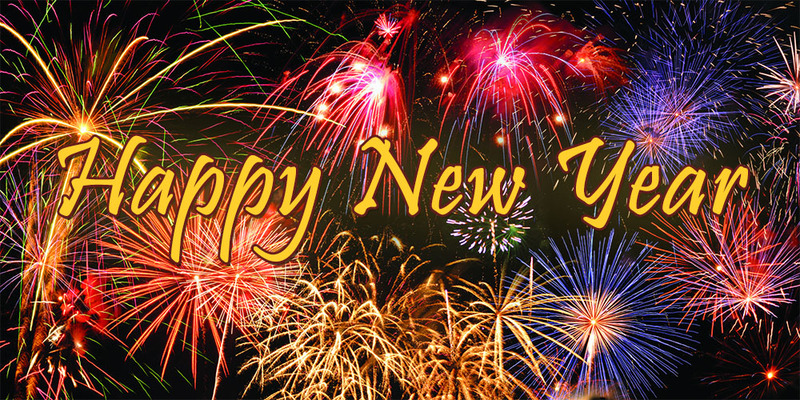 I’m here to make 2016 even better than 2015 – and with your continued support I’m sure to do just that. Besides, I already feel like I’ve won the lottery. So let’s continue our financial freedom journey the exact same way as we ended 2015. And no, this isn’t one of those instances in which you’re insane for doing the same thing over and over – we’re actually building a better future for ourselves. Thank you for your kind support over the past year and I wish you all the best for 2016! Congratulations NMW. What a fantastic year! To have hit all but one of your goals like that, in that fashion, you must be super chuffed! The one you fell short of, you were so close to, and had just reason for – A mighty good one I might add too. Keep up the great progress, and here’s to another super successful 2016! You’re absolutely right about goals being more about progression than rather hitting them. Better to aim high and fall short a bit rather than aiming low and crushing every one of your goals. A cracking year NMW! (And DK is a great way to start an article). Also, good to see the blog also growing at a smashing pace as well. Big fan of the old Donkey Kong Country (on the Super Nintendo) here, so I couldn’t resist to pick the above image for this post when I bumped into it a while ago, ha! Saving as much as possible remains the largest lever I can pull myself with regards to becoming financially independent, so you better believe that’s what I’ll be focussing on in 2016. I have no idea if the growth rate of this blog is anything special compared to other blogs out there, but I’m amazed by the amount of people I’ve reached in just a year and a half. Great job on the infographic, love it! And DK, damn, nostalgic! I wish I had your mentality when I was 26, but better late than never. Better late than never indeed! At 34 you’re still way ahead of almost everyone in your age group, so I’m sure you’ll get to financial independence well before anyone else you know. The infographics are definitely very nicely done. Impressive stats as well for 2015, but hey, this is a fun and informative finance blog! Looking forward to another great year. Best of luck in the new year to you guys too! Love the picture that you put together to summarize everyone. A great & successful 2015 indeed. Congrats and here’s to a great 2016. I had a bunch of fun too when putting together the infographic. It’s great to lay out the stats behind this blog in a fun and easy way – you should give it a try too! Here’s to another excellent year for the both of us, cheers! Congrats on hitting most of your goals, and quite impressive that you received 210k pageviews! I was stunned by the amount of page views too, but the readership is quite loyal. Almost everyone from the mailing list reads every article that comes out. I believe that helps a ton. If I had been more consistent with posting towards the end of the year, I’m sure the amount of page views would have been even higher. Congrats onheiiting most of your 2015 goals. Great blog numbers, hope to see the same thing in your financial side at 2016. You can bet on it that I’ll try to beat 2015 this year! On the blog side I’m going to try and be a bit more consistent with posting, while the financial aspect won’t change much: save and invest remains the mantra here. 2015 was a great year for you! The infograph is really cool. It tells the story well. Thanks, ATL! Best of luck in 2016 to you too! I just stumbled upon your blog and I read some articles with great interest. Since I’m a fellow Belgian, I was wondering: how can I start my own journey towards FI? Are there any good reads/guides out there for starting out? I already know Mr Moustache’s blog, but I feel it is too US centered to apply in my situation. As I’m also a Belgian investor (20 years old) seeking financial freedom, I can strongly recommend ‘The Intelligent Investor’ from Benjamin Graham (15 euro hardcover). It made me open my eyes to the importance of having a little knowledge about the stock market and to think more before buying. However I started on a speculative basis (I wanted some quick gains), I reoriented my investing strategy. I ended up with 3 different stocks I wouldn’t buy anymore and sell at a good price because the speculating went wrong. For every euro you make speculating, you’ll lose 2. My advice is to buy strong, fairly or preferably undervalued companies with a solid dividend history. In the long-term you will have nice gains and you will panic less when markets go down like the past days. Great choice of book indeed! There are a couple of aspects to financial indepdendence, but I’m not sure which part you are looking to read up on more. With regards to living frugally and saving as much as possible I believe Mr. Money Mustache is the way to go. Yes, he’s US focussed, but the basics of his teaching apply elsewhere too: cut out unnecessary expenses, focus on what makes you happy and save, save, save. Then there’s the investing part where you’ll have to make your money work for you. Depending on the strategy you’re going for, you’d do well to at least read up on index investing and dividend growth investing (two most popular methods). For the former I recommend the Boglheads forum or http://www.jlncollinshn.com. You can also read my Belgium-focussed articles here: http://www.nomorewaffles.com/2014/07/why-etfs-are-great-for-people-starting-out-in-the-stock-market/ and http://www.nomorewaffles.com/2014/07/my-etf-strategy-and-portfolio/ . The best-known website for the latter strategy is probably http://www.dividendmantra.com, but he’s not active anymore. Other good options are http://www.dividendgrowthinvestor.com. And I recommend you read through the blogs of some people (mine for example). A lot of information is hidden or not overtly visible, mainly when it’s about life style choices. Best of luck and I hope this answered your question! Big congrats on your impressive progress last year! Lots of things have changed related to investing in Belgium in 2016, as I’m sure you are aware of. You’re probably not too worried about the speculation tax, but I wonder how you feel about the increased dividend tax from 25% to 27%, which is especially harsh on dividends from REIT’s which goes from 15% to 27% as well. It seems to me that Belgium is a harsh place to do dividend investing. You basically lose almost 1/3th of your income to taxes – put another way, you need to have invested 50% more capital to make the same after-tax dividend income. Compared to some other countries where the first few thousand of dividend income are tax-free (the remainder being taxed as income, which is still probably less than 27% for smaller income), this puts us (yes I’m from Belgium as well) at a distinct disadvantage. Have you thought about this? Do you have any ideas on how to minimize the taxes you need to pay? Or do you plan on following Rambi’s lead and just charge ahead, taxes be damned? Looking forward to more great articles from you this year. Quite a lot of things have changed indeed. The speculation tax seems like a useless measure and doesn’t affect me in the slightest, so I’m not too worried about it. The increased dividend taxation from 25% to 27% hurts though, especially with regards to the REITs. Belgians are definitely at a disadvantaged compared to other countries with regards to dividend growth investing. For some bizarre reason our government didn’t think it necessary to create a level playing field between different investment vehicles (savings accounts, insurance products, bonds, stocks, etc.) and investment strategies. I hope a clearcut tax law without any exceptions is in our immediate future, but I doubt it. With that being said, I’m not going to change my investment strategy only because of tax law. As you can see, I’m still doing extremely well even though I’m growing my income at a slower pace than neighbouring countries. Of course if taxes on dividends increase even further the disadvantage could become too much to bear, which is when I’d turn to capital appreciating assets like non-distributing ETFs. Thanks, friedm! Glad to have you on board. Hey waffles, what are your thoughts on January being really volatile? Not much to say in my opinion except “eye roll”. 🙂 We’re at a great moment in time where we can see how inefficient and irrational the market can be. The overall value of the stock market is mainly impacted by outside (political) forces because of the free money policy of the US and EU central banks, the monopolistic tendencies of OPEC, and the Chinese planned economy. I keep saving and investing as if nothing happened. In a couple of months or years we’ll have forgotten all about this already anyway! Congrats on having an awesome year! Great result on your goals too – that’s 25% better than Meat Loaf as he could only manage 2 out of 3, yet you did 5 out of 6! I’m impressed with how you’ve embraced financial independence as a total lifestyle and not just personal finance. Life is a journey, FI is a journey; it’s what we learn along the way that improves us so that we can arrive at an even better place. Financial independence has always been about more than just the money to me, to be honest. The financial aspect is simply a means to an end, i.e. the freedom it buys you from anything and everyone in every aspect of your life. Besides, what’s the point of amassing a huge amount of money if we’re not willing to improve ourselves and thus better our lives? All the best in 2016, but I’m guessing that won’t be a problem. Cheers! Hi NMW, congratulations on the fantastic year! Your blog got me on the track to dividend growth investment and even inspired me to start a blog as well. Keep it up! And I’m happy to hear I played part in your dividend growth investing journey and financial independence prospects – it’s always great to meet inspired and excited readers. I’ll definitely check out your blog.